Can a Dentist Fix My Tooth Gap? I’ve always had perfect teeth but lately I’ve noticed a small gap between my front teeth. It’s not huge but totally bugs me. I want to get my perfect smile back. What can I do? I was thinking Invisible braces. Is that a decent option? 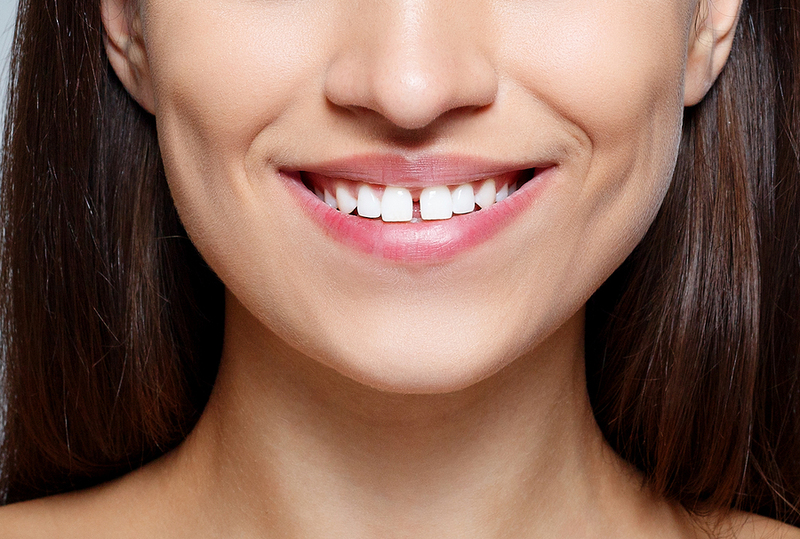 There are quick and easy fixes for a tooth gap. There’s nothing wrong with wanting to have your smile back. Especially if, like you, your smile was always perfect. Fortunately, there are several ways to fix this. Your suggestion of invisible braces would totally work. While Invisalign is the most well-known brand, Dr. Potts prefers Clear Correct. They’re equally, if not more, effective and cost less for the patient. They have an added benefit of being able to double as teeth whitening trays. This allows you to knock out two cosmetic procedures at once, saving you time and money, as well as providing patients with a mini-smile makeover. If you needed your teeth whitened, this would be the method I’d suggest for dealing with your gapped teeth. 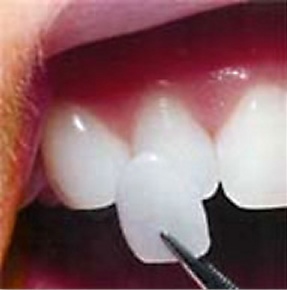 Tooth bonding uses a composite resin that the dentist will hand sculpt onto your teeth, closing the gap. This is actually the method I would recommend for you. It is ideal for patients like you, who otherwise have a gorgeous smile that needs no other work. The results depend on the artistic skill of the dentist so make sure you check out examples of their work before committing. Bonding will eventually need to be replaced after a number of years. I only really recommend this for patients who have other things they want to change about their smile. I know that isn’t you, but I’m putting it here for the benefit of others who may be looking at the answer to your question but don’t have an ideal smile. Veneers are a total smile makeover. The can change the color, size, and shape of your teeth, including closing small gaps all at once. Again, it’s not for you but many other patients can change their lives with them. How Do You Know if a Dentist is Good? I’m thinking about getting my teeth whitened and then getting porcelain veneers. How will I know if the dentist is good enough? You’ve asked a great question. Before I answer I want to make sure you know that porcelain veneers can whiten your teeth along with the rest of the smile makeover you’d want, such as changing the shape and size of your teeth. Most people just get them placed on their upper arch and then whiten their lower arch. So, you can only whiten those bottom teeth instead of both. If you’re happy with the shape and size of your teeth, then you can just whiten both arches and save a ton of money. Otherwise, you want to get the veneers. Choosing your cosmetic dentist is one of the most important decisions you can make in your smile makeover. Every dentist who does smile makeovers has a brag book of sorts. It’s a collection of before and after pictures of cosmetic dentistry cases. Ask to see it. Also, ask them if the pictures are of work they did themselves. Some dentists, just starting out, will try to pass off stock photos because they don’t have any of their own yet. There are several sights online that allow patients to rate and comment on their experiences with their dentist, such as Yelp!, Google Reviews, and Rate My Doc. Go over these reviews to make sure the dentist’s work held up as well as their chairside manner being pleasant and polite. You don’t want to have to work with someone who’s unpleasant. You want a dentist who is willing to back up their claims of giving you a gorgeous smile. Do you have recourse if you hate what they create? Look at Dr. Potts’ Beautiful Smile Guarantee to get an idea what you should expect. This blog is brought to you by Dr. David Potts. Ask him about dental sedation. Is It Safe to go to a Regular Dentist for Porcelain Veneers? I’m interested in getting porcelain veneers. My dentist says he does them, but he’s a general dentist. Should I go to a cosmetic dentist for this or am I safe with my dentist? Your question brings up quite a common misconception. Every cosmetic dentist is a general dentist. There isn’t a recognized cosmetic dentistry specialty by the American Dental Association (ADA). What that means is that any general dentist who does cosmetic work can call themselves a cosmetic dentist. However, each dentist has a different level of skill when it comes to creating beautiful smiles. So, how will you know if your dentist can give you beautiful porcelain veneers? First, ask to see his smile gallery. If he does enough cosmetic dentistry he should have a brag book of sorts with cases he’s done. Don’t let him show you stock photos. Tell him you want actual before and after pictures of his clients. If he balks at that, run away…fast. He should be proud of his work. If he’s not, that’s a red flag. Second, Make sure he has a beautiful smile guarantee. Essentially, that means he’ll do the porcelain veneers and place them on you with a temporary try-in paste. Under no circumstances should you allow him to permanently bond them on without you seeing what they look like on you in a variety of lighting AND you give your approval. If you love what you see, then he can bond them on. If you don’t, he should be willing to go back to the lab and re-do them. Then, he should do the try-in paste again. He should be willing to do that as many times as necessary to give you the smile you’re paying for. I have a reunion coming up that I’m dreading. I had a horribly ugly smile in High School and was mercifully teased for it. I know I should be above the insecurities of High School, but I really thought my life would be different by now. But, I’m buried in student loans and haven’t been able to do anything to fix my smile. I don’t think I can show my face with the same teeth. Is there any way to get a smile makeover on a budget? First, I don’t want you to feel alone. There was a survey done which said half of all Americans are unhappy with some aspect of their smile. I’m willing to bet several of your classmates in High School were embarrassed about theirs as well. As far as a smile makeover on a budget, there are things you can do to improve your smile that won’t cost a fortune. One thing I want to warn you off, though, is trying to get porcelain veneers cheaply. While they are the best procedure for a smile makeover, it’s usually inexperienced dentists or ones who lack artistry who offer them at a discount. You’ll end up with disappointing results. That doesn’t mean you can’t do anything affordably. The biggest problem I have is you didn’t mention anything specific about what you wanted to fix. I can recommend some general things, though. One of the nicest things you can do is simply whiten your teeth. It takes years off your appearance. However, if your smile bothered you in High School, I doubt staining was the problem. If you have crooked teeth, Invisible braces such as Clear Correct are a great solution. You can straighten your teeth without the ugliness or uncomfortableness of traditional metal braces. If you just want something to get you through that particular reunion, Snap-on Smile is a decent option. Below is a picture giving you an example of what it can look like. Mind you, it won’t be stunning, like porcelain veneers but it will give you a completely new smile, at least temporarily. I chipped my tooth and wanted to get in right away for my dentist to repair it, but my dentist doesn’t consider it an emergency. I’m supposed to go on a date tonight–my first one in five years (since my husband left). I’m nervous enough about my first date, without having to be humiliated and embarassed about this tooth. Is there anything I can do to fix his or should I cancel my date? Many dentists, especially cosmetic dentists, would consider this an emergency. However, just human decency, knowing your situation would mean trying to fit you in. Life is stressful enough, without having to add pressure to it. If you can’t get your dentist to understand the situation, I’d call around to some cosmetic dentists in your area. One of them is bound to understand and help you. They will probably only be able to do some dental bonding. You’ll want a more permanent situation later, like porcelain veneers, but this will get you through your date with confidence. This blog is brought to you by Libertyville, IL Dentist Dr. David Potts. I’ve got four dental crowns. Two of them are in the back and are not visible. But two of them are my canine teeth which are very visible. They’ve gotten kind of stained over the years. I wanted to whiten my teeth anyway. So would I just be able to whiten my crowns with regular teeth whitening or do crowns need a special type of teeth whitening? You have asked a great question. Professional teeth whitening will do a great job in giving you brilliantly white teeth, however it will not whiten your dental crowns (or any type of dental work such as bonding or veneers) at all. Here is my recommendation. You mentioned that your dental crowns are stained. I don’t know how long you’ve had these crowns, but it may just be time to replace them. BEFORE you replace them, you should whiten your other teeth. Don’t worry about your crowns because the whitening gel will not negatively affect them. Give the whitening about two weeks to settle, then you can have your crowns replaced. When you do replace them, I highly suggest you get all porcelain crowns. I don’t know what kind of crowns you currently have, but the porcelain will absorb and reflect light the way your natural teeth do. They also are more natural looking. A good cosmetic dentist will be able to match your crowns to your new white teeth with ease. Please let me know if your dental crowns are not very old. If that is the case then it means the glazing on them was damaged, which is why they are stained. With the proper glazing, dental crowns will last for many years and retain their brilliant color without picking up any stains.